There’s nothing worse than being hungry and searching for a restaurant as your kids begin melting down in “hanger.” Recently, my husband and I found ourselves on yet another Friday night, trying to decide where to head for dinner with our kids. Our criteria for a great restaurant is like most parents: yummy food for the whole family and kid-friendly options on the menu - bonus points for quick service or fun kid activities. Luckily for us, Hamilton County, Indiana is full of family-friendly dining options!So, whether you’re here for a weekend of exploring or you call this area home, here are some of my favorite suggestions for dining out with kids. Grab some extra napkins for this Westfield barbecue joint because you’re going to need them. Tender, juicy meat that’s smoked right on-site is what makes this dining spot a hit for all ages. Little Hoffa Meals are sized for little ones and include a drink. Or grab a family meal with all the fixings and share with the whole table. Casual and comfortable, your family will feel right at home. For adventurous eaters and families looking for a little culinary exploration, check out OMONI. This fast casual Korean restaurant serves up unique cuisine with lots of choices. Check out the Korean tacos or more traditional beef and rice bowls. Everything is customizable and if you’re not sure what to order the extremely friendly staff will be happy to walk you through your choices. 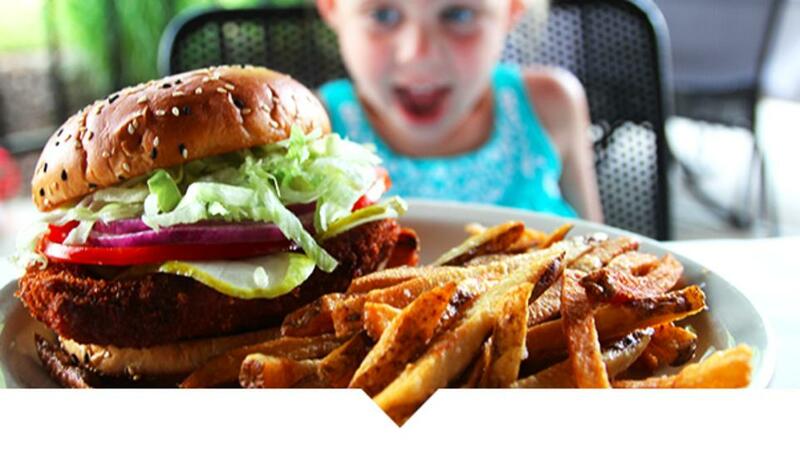 Kids can order their own pint sized meals as well. Familiar items like beef tacos, quesadillas and noodles all have a unique Korean twist. The food is delicious and your kids will love trying something new! Right in the heart of Fisher’s Nickel Plate District, Brixx is offering up wood-fired pizzas that no kid will turn down! Pizza makes a great family meal since everyone is sure to enjoy and with Brixx unique offerings, including gluten-free crusts, both parents and kids will be satisfied. Kids can order smaller kid pizzas or share one for with the whole table. For an extra special surprise, order the dessert s’mores pizza complete with wood-fired marshmallows from the brick oven. A long-standing tradition right along Carmel’s Main Street, Bub’s Burgers and Ice Cream is the family burger joint your kids will be begging to return to. Feeling adventurous? Try the elk burger or Mahi Mahi sandwich. Or go for the Bub’s Big Ugly challenge, a one pound after cooking, dinner-plate sized burger, not for the faint of heart (or stomach). Kids can play the outdoor games while you wait or take a stroll along the Monon Trail in anticipation of ordering some extra loaded waffle fries. Afterward, grab some ice cream from the front counter to finish off the perfect meal. Rosie’s Place sits on the picturesque square of downtown Noblesville and offers up both breakfast and lunch options that will have everyone’s mouth watering. There’s a kids menu with lots of options and delicious farm-fresh inspired dishes for mom and dad. If you’re in a hurry or the wait is a bit too long, grab some yummy bakery treats to go. Do NOT skip the gooey butter cookies in any flavor. You can thank me later! And finally, treat your family to the most authentic of Hoosier meals, the tenderloin sandwich. Hamilton County just so happens to be home to the Tenderloin Trail, your complete guide to sampling this Indiana delicacy. Check out this list of kid-friendly options for ideas! Don’t let “hangry” kids derail your culinary explorations. This list of family-friendly Hamilton County restaurants will make sure both the grown-ups and the kids in your family have lots of great choices, no matter what time of day it is or how hungry your gang may be! Did we miss your family&apos;s favorite? Let us know in the comments below, and be sure to follow us on Facebook, Twitter and Instagram for more good eats in #VisitHC.